The rainforest is home to millions of plant and animal species. The inhabitants of the rainforest depend on each other and they all depend on rain. How much rain falls in a rainforest? How do scientists work in the treetops? What kind of plants are swimming pools for frogs and crabs? Read and find out! 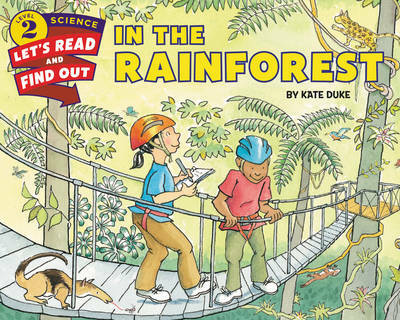 Now rebranded with a new cover look, this book features rich vocabulary, fascinating side bars and diagrams, and a find out more section with a build a rainforest terrarium activity and web research prompts about rainforest exhibits across the country. Both text and artwork were vetted for accuracy by Dr. Meg Lowman. This is a Level 2 Let's-Read-and-Find-Out Science title, which means the book explores more challenging concepts for children in the primary grades and supports the Common Core Learning Standards, Next Generation Science Standards, and the Science, Technology, Engineering, and Math (STEM) standards. Let's-Read-and-Find-Out Science is the winner of the American Association for the Advancement of Science/Subaru Science Books & Films Prize for Outstanding Science Series.